For the wavies out there, you have three options. Your hair is probably fine the way it is in spite of what you think, but you can also try straight or curly hair. Straight hair is easy enough. When you get out of the shower, blow dry and use a straightening iron. Even if it curls at the edges, it will still look pretty sleek given that waves aren't difficult to straight out. Getting curlier hair, however, is a whole different ballgame. Type 3 and 4 hair both have an easier time molding their hair and curls (aside from their battle with excessive frizziness and need for strong hold products). But for type 2 hair, curlier hair can be more difficult to come by. If you’re one of the wavies who want more curl, a perm is an excellent option. If you want curlier hair, or simply have a desire to embrace your natural waves and just want more of them, a perm on wavy hair may be worth a try. Perming is a process by which the hair is chemically altered. The perming process can do everything from straightening to curling hair by softening the proteins that make up your hair in a chemical bath. If you are desperate for more curl in your wavy hair, a perm or a partial perm is one solution. The perm lasts for as little as two months and as many as up six months, which is a great time saver for wavies in the long run. And if a perm on wavy hair is done properly, there are an infinite number of choices for hair styles. Aside from the overblown fried look of the 1980’s, as long as you have a photo in hand, a good stylist can recreate that curly look. 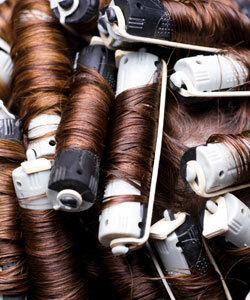 Although there are plenty of positive reasons for perming, there are some drawbacks. Because perming causes the chemical alteration of your hair, it can also cause significant damage. For one thing, this means a perm may do more harm than good especially if you do not choose your stylist wisely. In this case, you should take caution in a perm on wavy hair and any other treatments or products you use to prevent excessive drying and damage. Find hydrating shampoos, conditioners and styling products and begin using them before and after you receive a perm. This will reduce dryness which can lead to significant tearing and breakage, and in extreme cases, hair loss. In spite of the pros and cons to perming, it all comes down to choice. Your personal preference should be what drives you and not the newest fads to hit “the scene.” Perming, like any other chemical treatment, is a long process, and a perm on wavy hair can be caustic to your hair. So if you feel that the issues are too high even if you want those curly locks, opt for some inexpensive alternatives such as a curling iron and hair products that are dedicated to curling hair. But if you’re one of those people who loves the idea or has permed in the past, go for it! Research for your perm beforehand! Call salons to see if there is a perming specialist on board or if you have a friend that does it, ask them. Once you’ve received your perm, remember that moisture and using products that are dedicated to permed hair are important for maintaining those curly locks. Because perming alone can cause damage, never perm your hair if you’ve been coloring or using other chemical treatments. That’s a sure fire way to lose that curl and your hair!